Each year the NH Fish and Game Department tracks the severity of our winters to evaluate its effect on wildlife. Of most importance to the sportsmen of the state is the effect on white tailed deer. 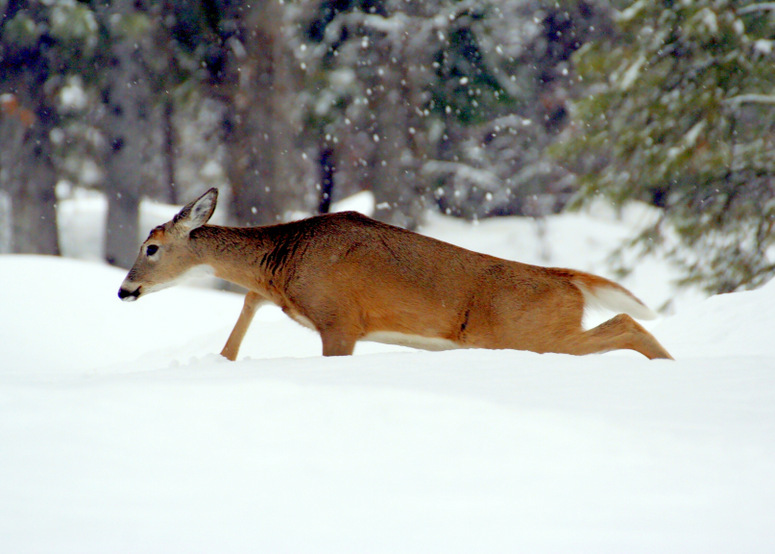 The average adult doe goes into the winter with about a three-month supply of fat reserves. Theoretically every WSI day takes an additional day off those reserves. A Winter Severity Index (WSI) day is any day that the snow is more than 18” deep or the temperature is below zero. If both of those criteria are met in the same day, it is then a 2 WSI day. I have the state WSI records from 1964 through 2009 and my own after that. The worst winter on record was 1969 to 1970 with 112 WSI state-wide average. The best winters were 2005 and 2009 with just 13 WSI. The statewide average is 47 due to the White Mountains and the area north of the Notches. The mean average for our Wildlife Management Unit (WMU), I2, is 33 WSI. For the WMU immediately south of us, H2, the average is 26 WSI. I have tracked, by my measurements the number of WSI *so far* this winter. We have had 39 consecutive days of 18”+ of snow on the ground plus 14 days of subzero temperatures. So my WSI is at 53 right now; not good, not terrible. I was out today taking a multitude of measurements, and it is tough to average, but I believe we have broken the prolonged negative streak. The snow depth ranged from 10” on steep south-facing slopes, to 22” in spots shaded or facing northeast. Most places it was between 14” and 18”, so I’m averaging it to be 16”. 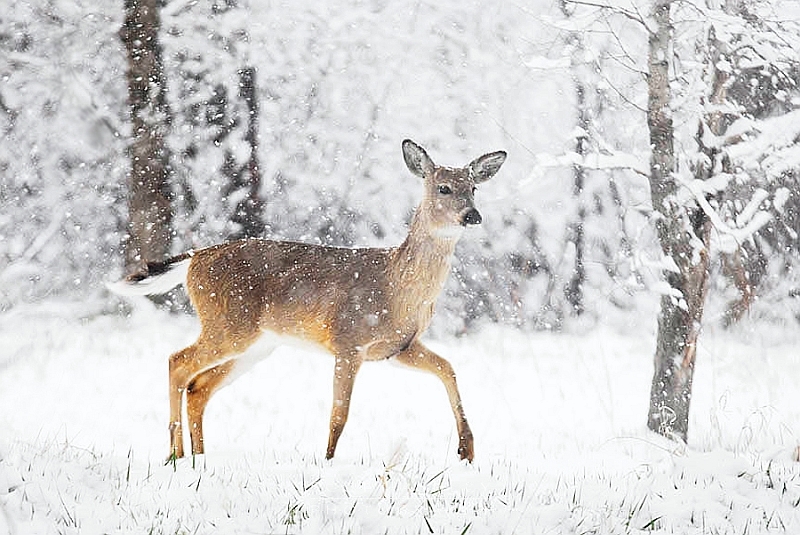 Deer are built to deal with severe weather. Their metabolism will slow dramatically during severe weather, but for only so long. March is the killer month, and believe it or not April is too. The deer are at the end of their reserves, so late snows and prolonged cold snaps in those months are the worst. When the fat reserves are gone, their bodies then go after the marrow in their bones. Once that happens there is no going back. They may live on for days, even weeks, but in the end they are gone. It is a terrible thing to see. The winter of 1969 in Vermont, which at the time had the densest deer population in the country, was a disaster. Vermont went into that winter with about 350,000 deer. That spring it was estimated that less than 150,000 survived. I saw 14 dead deer in an area smaller than my living room. That was a day that I will never forget. The only good thing that came out of that was that the legislature returned control of the deer herd to the biologists of Fish and Game after Fish and Game officials took truckloads of dead deer to the state house in Montpelier. The state would never again see the deer population that they had in the 60’s, but they would never again see such carnage either. POLITICS HAS NO PLACE IN WILDLIFE MANAGEMENT! I’m off my soap box now. Every March I think of that day, and I worry about those animals like I do the family dog. This entry was posted in Deer, Weather and tagged deer, weather, wsi. Bookmark the permalink.